During the spring, we receive a lot of calls for backed up drains and roots in pipes. 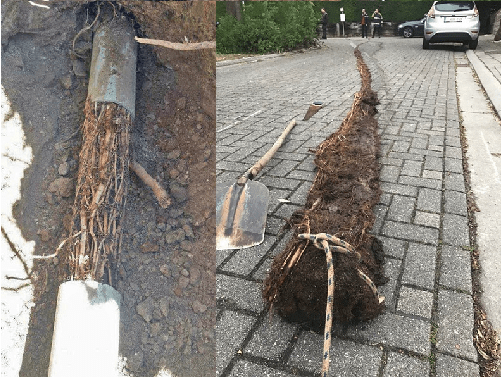 According to the Davey Tree Institute, tree root growth slows around 36 degrees Fahrenheit, and when it’s freezing, root growth pauses until the soil warms again. Roots damage pipes by breaking through their connections and seals, creating blockages which result in backed up pipes and slow drains. A trained plumber can run a snake and camera to determine if the cause of your backed up drain is roots. One of the most common methods we use to mitigate roots is a product called Root-X, an herbicide that is safe for pipes and septic systems, and won’t harm above ground vegetation. Root-X mitigates live root blockages for up to 12-months by foaming on contact with water and sticking to pipe walls; this helps pipes to keep operating at full capacity, and can prevent re-growth for up to 2 years. The cost associated with repairing lines damaged by root growth often exceeds that of new construction. This is due to the damage caused by sewer back up, including flooding of property. For preventative treatment, contact Benjamin Franklin Plumbing today.